The Bikers with Attitude and Determination Group (BAD Gang) has urged corporate organisations, individuals and government agencies to engage in corporates social responsibilities (CSR) that will have huge impact on human lives rather than building monuments. 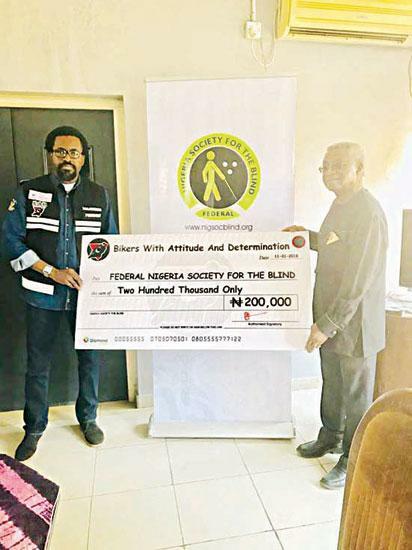 Segun Sholanke President (BAD Gang) presenting the cheque of N200,000 to the Federal Nigeria Society for the Blind Chairman, Asiwaju Fola Osibo. Speaking after presenting a cheque of N200,000 among other items to ease the vocational training of the visually impaired at the Federal Nigerian Society for the Blind (FNSB) in Lagos, the president of the group, Mr. Segun Sholanke said: “The organisation should be more innovative in prioritising their CSR on impacting lives rather than building monuments and flower gardens in roundabouts amounting to millions of Naira, without visible impact. NGOs like FNSB that focuses on vocational training for the visually impaired should be encourage.”he said. The post Group lifts the visually impaired with N200,000 appeared first on Vanguard News.